A majority of Americans say race relations in the United States are bad, and of those, about seven-in-ten say things are getting even worse. Roughly two-thirds say it has become more common for people to express racist or racially insensitive views since Donald Trump was elected, even if not necessarily more acceptable. Opinions about the state of race relations, Trump’s handling of the issue and the amount of attention paid to race vary considerably across racial and ethnic groups. Blacks, Hispanics and Asians are more likely than whites to say Trump has made race relations worse and that there’s too little attention paid to race in the U.S. these days. In addition, large majorities of blacks, Hispanics and Asians say people not seeing discrimination where it exists is a bigger problem in the U.S. than people seeing it where it doesn’t exist, but whites are about evenly divided on this. This chapter also explores Americans’ views of intergroup relations; whether they think the better approach to improving race relations is to focus on what different groups have in common or on the unique experiences of each racial and ethnic group; whether they have ever heard friends or family members make potentially racist or racially insensitive comments or jokes and, if so, did they confront them; and views about white people and black people using the N-word. About six-in-ten Americans (58%) say race relations in the U.S. are generally bad, a view that is held by majorities across racial and ethnic groups. Still, blacks (71%) are considerably more likely than whites (56%) and Hispanics (60%) to express negative views about the state of race relations. Democrats have more negative views of the current state of race relations than Republicans. About two-thirds of Democrats (67%) say race relations are bad, while Republicans are more evenly divided (46% say race relations are bad and 52% say they are good). These partisan differences are virtually unchanged when looking only at white Democrats and Republicans. Overall, 53% of the public says race relations are getting worse. 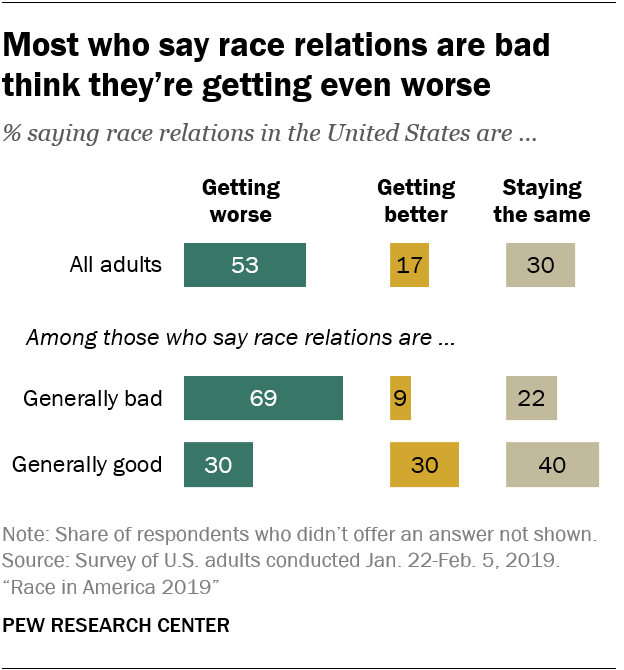 Views are particularly pessimistic among those who say race relations are currently bad: 69% of this group says race relations are getting even worse, and 22% say they’re staying the same. Just 9% think they’re getting better. Among those who say race relations are good, 30% see things getting even better, while 30% say they’re getting worse and 40% don’t see much change. Two years into Donald Trump’s presidency, 56% of Americans say Trump has made race relations worse. 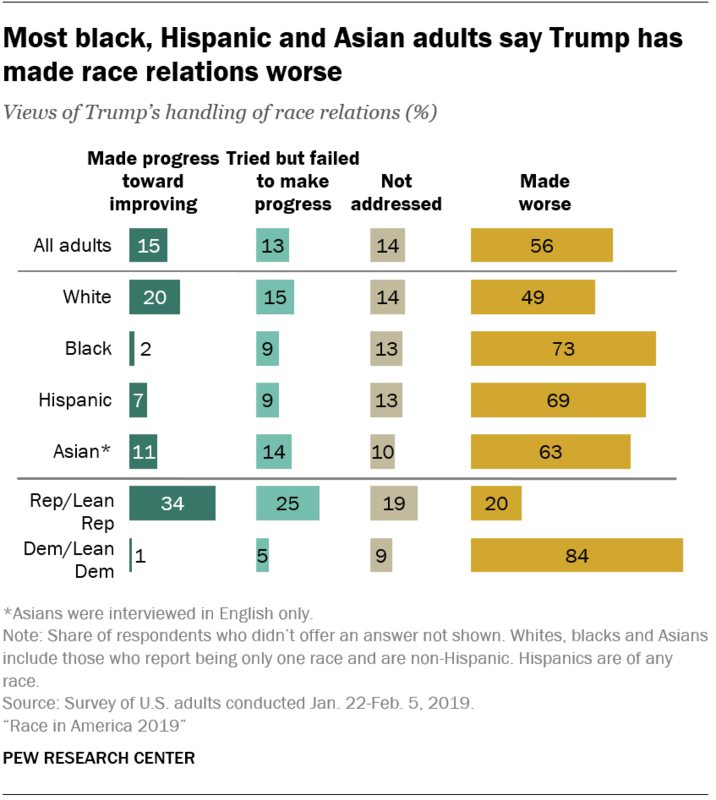 A relatively small share (15%) say the president has made progress toward improving race relations, and 13% say he has tried but failed to make progress; 14% say Trump has not addressed race relations. Assessments of the president’s performance on race relations vary considerably along racial and ethnic lines. Most blacks (73%), Hispanics (69%) and Asians (63%) say Trump has made race relations worse, compared with about half of whites (49%). Democrats and Republicans have widely different opinions of the president’s handling of race relations. Fully 84% of Democrats say Trump has made race relations worse, compared with 20% of Republicans. And while 34% of Republicans say Trump has made progress toward improving race relations, virtually no Democrats (1%) say the same. Among Democrats, views on this don’t vary much along racial or ethnic lines, but white Democrats (86%) are somewhat more likely than black Democrats (79%) to say Trump has made race relations worse. Majorities across racial and ethnic groups say it has become more common for people to express racist or racially insensitive views since Trump was elected, but blacks (76%) and Hispanics (75%) are more likely than whites (60%) to say this is the case. Whites are more likely than blacks and Hispanics to say expressing these views is about as common as it was before Trump’s election. Democrats are twice as likely as Republicans to say it has become more common for people to express racist or racially insensitive views since Trump was elected (84% vs. 42%). Half of Republicans – vs. 12% of Democrats – say people expressing these views is about as common as it was before, while small shares in each group say it is now less common than before Trump’s election. These partisan differences remain when looking only at white Democrats and Republicans. Among whites and blacks, the view that expressing racist or racially insensitive views is now more common is particularly prevalent among those with more education. Some 84% of blacks with a bachelor’s degree or more education and 86% with some college experience offer this opinion, compared with 66% of blacks with a high school diploma or less education. Among whites, the difference is between those with at least a bachelor’s degree (71% say expressing these views has become more common) and those with some college (55%) or no college experience (53%). While most Americans say it’s become more common for people to express racist or racially insensitive views since Trump’s election, fewer (45%) say this has become more acceptable. About a quarter (23%) say it’s now less acceptable for people to express these views, and 31% say it’s about as acceptable as it was before Trump was elected. Overall, blacks (53%) are more likely than whites (43%) or Hispanics (45%) to say it’s become more acceptable for people to express racist or racially insensitive views. Among Democrats, however, whites are the most likely to say this (70% of white Democrats vs. 55% of black and 57% of Hispanic Democrats). Again, educational attainment is linked to these views. Among whites, blacks and Hispanics, the view that it has become increasingly acceptable for people to express racist or racially insensitive views is more prevalent among those with more education. Overall, 58% of adults with at least a bachelor’s degree say this has become more acceptable since Trump’s election, compared with 44% of those with some college and 36% of those with a high school diploma or less education. Views on whether it’s become more acceptable for people to express racist views since Trump was elected are also strongly linked with partisanship. More than six-in-ten Democrats (64%) say this is now more acceptable; 22% of Republicans say the same. Republicans are far more likely than Democrats to say this is about as acceptable as it was before Trump’s election (50% vs. 15%). Despite their generally negative assessments of the current state of race relations, Americans tend to say that most racial and ethnic groups get along well with one another. 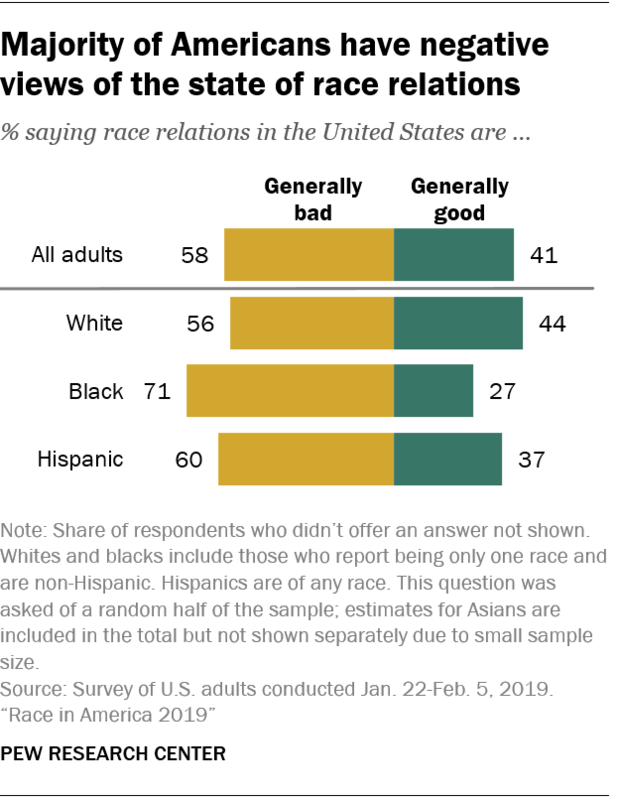 Among those who gave an answer, about six-in-ten or more say this is the case for whites and Asians (88% say these groups get along very or pretty well), Hispanics and Asians (73%), blacks and Hispanics (65%), whites and Hispanics (63%) and blacks and Asians (62%). Relatively large shares do not know enough about how some of these groups get along to give an answer. Assessments of how well blacks and whites get along are more divided. Among those who gave a rating, 51% say these groups generally get along well, while 49% say they don’t get along too well or at all. Whites are far more positive than blacks in their views of how the two groups get along. About six-in-ten whites (58%) say blacks and whites get along well; the same share of blacks say these groups do not get along well. There’s a significant age gap among blacks on this issue: Blacks ages 50 and older express more positive views of black-white relations than do their younger counterparts. Among those in the older group, 53% say blacks and whites get along very well or pretty well, compared with 33% of black adults younger than 50. Whites and Hispanics also offer considerably different views of how their groups get along, though majorities of each say they get along very well or pretty well (70% of whites vs. 54% of Hispanics). And while large shares of blacks and Hispanics say their groups generally get along, blacks (83%) are more likely than Hispanics (69%) to say this. While those who say race relations are good are consistently more positive about how these groups get along, more than half of those who say race relations are bad also say intergroup relations – with the exception of black-white relations – are also generally positive. When it comes to how blacks and whites get along, just 36% of those who say race relations are bad say these groups get along well, compared with 76% of those who say race relations are good. More than half of Americans (55%) say that, when it comes to improving race relations, it is more important to focus on what different racial and ethnic groups have in common; 44% say it’s more important to focus on each group’s unique experiences. Asians (57%), blacks (54%) and Hispanics (49%) are more likely than whites (39%) to say it’s more important to focus on the unique experiences of different racial and ethnic groups. Still, about four-in-ten or more of these racial and ethnic minorities say the better approach to improving race relations is to focus on what different groups have in common. Among whites, opinions vary considerably across age groups. Younger whites are the most likely to say that, when it comes to improving race relations, it’s more important to focus on what makes different groups unique: 54% of those younger than 30 say this. In contrast, majorities of whites ages 30 to 49 (57%), 50 to 64 (63%) and 65 and older (67%) say it’s more important to focus on what different racial and ethnic groups have in common. Age is not significantly linked to views about this among blacks or Hispanics. About four-in-ten Americans (41%) say there’s too much attention paid to race and racial issues in the country these days; 37% say there’s too little attention, and 21% say it’s about right. Whites are far more likely than other racial and ethnic groups to say there’s too much attention paid to race, while blacks are more likely than other groups to say too little attention is paid to these issues. Half of whites say too much attention is paid to race and racial issues these days, while smaller shares say there is too little (28%) or about the right amount of attention (21%). In contrast, about two-thirds of blacks (67%) and half of Hispanics say there’s too little focus on race. Asians are more divided, with similar shares saying there’s too little (39%) and too much (36%) attention paid to race and racial issues. A quarter of Asians say the amount of attention paid is about right. Among whites, the view that the country is too focused on race is more common among those who are older and without a bachelor’s degree. Opinions also differ considerably across party lines: Three-quarters of white Republicans think there’s too much attention paid to race and racial issues, compared with 21% of white Democrats. About half of white Democrats (48%) say there’s too little attention paid to these issues and 29% say it’s about right. Black Democrats are far more likely than their white counterparts to say there’s too little attention paid to race: 71% say that’s the case. When it comes to racial discrimination, a majority of Americans (57%) say the bigger problem for the country is people not seeing discrimination where it really exists, rather than people seeing racial discrimination where it really does not exist (42% say this is the bigger problem). More than eight-in-ten black adults (84%) and somewhat smaller majorities of Hispanics (67%) and Asians (71%) say the bigger problem is people not seeing racial discrimination where it really exists. Among whites, about as many say the bigger problem is people overlooking discrimination (48%) rather than seeing it where it doesn’t exist (52%). Younger whites, as well as whites with a bachelor’s degree or more education, are more likely than older and less-educated whites to say the bigger problem for the country is people not seeing racial discrimination where it really exists. Views also differ sharply by party, with white Democrats and white Republicans offering views that are the mirror image of each other: 78% of white Democrats say the bigger problem is people not seeing discrimination where it really exists, while 77% of Republicans say the bigger problem is people seeing discrimination where it doesn’t exist. Relatively small shares of Americans overall think all or most white people in the country are prejudiced against black people (9%) or that all or most black people are prejudiced against whites (13%). But majorities say at least some whites and blacks are prejudiced against the other group (70% say this about each group). Among blacks, one-in-five say all or most white people in the U.S. are prejudiced against black people; 6% of whites say the same. The difference, while significant, is less pronounced when it comes to the shares of blacks (10%) and whites (14%) who say all or most black people are prejudiced against white people; 12% of Hispanics and 17% Asians say this. Whites (46%), blacks (44%), Hispanics (47%) and Asians (45%) are about equally likely to say they often or sometimes hear comments or jokes that can be considered racist or racially insensitive from friends or family members who share their racial background. About half in each group say this rarely or never happens. 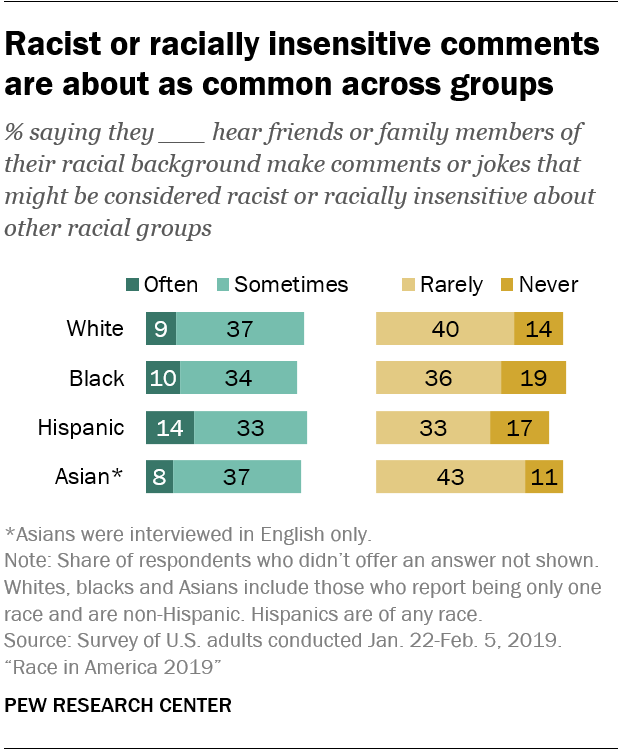 Among those who say they hear these types of comments, even if rarely, majorities of whites (64%) and blacks (59%) say they have confronted a friend or family member who shares their racial background about this; 50% of Hispanics and 44% of Asians say they have done this. While many say they have confronted a friend or family member who has made a racist comment, the public is skeptical that others would do the same. Only 6% of all adults think all or most white people would confront a white friend or family member who made such a comment about people who are black, and 3% say that all or most black people would do the same if a black friend or family member made a racist comment about people who are white. Most Americans (70%) – including similar shares of blacks and whites – say they, personally, think it’s never acceptable for a white person to use the N-word; about one-in-ten say this is always (3%) or sometimes (6%) acceptable. Opinions are more divided when it comes to black people using the N-word: About half say this is rarely (15%) or never (38%) acceptable, while a third say it is sometimes (20%) or always (13%) acceptable. Again, black and white adults offer similar views. Among blacks, opinions about the use of the N-word by black people vary across genders and age groups. Black women are more likely than black men to say this is never acceptable (43% vs. 31%). And while half of blacks ages 50 and older say it’s never acceptable for black people to use the N-word, 29% of blacks younger than 50 say the same.